There is not much to Les Ulis, a collection of shabby concrete and ill-concieved mid-century tower blocks, born of the booming 1960s French economy. It is a town far from the emotional heart of the student uprisings that took place later in the decade and the cultural renaissance that followed. Located in département Essonne, some 20 miles south of Paris, Les Ulis boasts little of note. Courtabœuf, one of the continent’s largest industrial parks, forms a large part of the area’s post ’60s development. It is a suburb seemingly far from the nation’s cultural heartbeat, but one that has become a maternal home to myriad talent. Thierry Henry, Yaya Sanogo, Patrice Evra, and Anthony Martial, call Les Ulis home. Founded in 1977, amid the building works of the new town, Club Omnisport des Ulis operates much as it has for the best part of 40 years. It is a breeding ground for youth, a social club for the local community, and a team barely ascended from the lower reaches of the French league system. Martial’s rise to the professional ranks was hardly certain then, although the adage that talent begets talent may well be true however modest the surroundings. Martial’s acquisition by Manchester United was not without criticism this side of the channel, nor doubt back in France. Humble beginnings will breed that. The predominant opinion was that Martial owned a sharp talent, but one that had achieved limited returns in less than 50 matches as a professional. After all Monaco had snapped up the youngster as a 16-year-old for just €5 million in 2013, and while there was much hope for the free-scoring French under-16 international, no guarantee comes with a talent so raw. And in truth few supporters knew much about Martial before United’s deadline day largess; a transfer that will cost the club at least €40 million, with substantial add-ons should Martial become one of the planet’s finest. Even those who caught Monaco’s Champions League fixture against Arsenal last season, will only fleetingly remember the player, save for the sprightly run and pass that enabled Dimitar Berbatov for the French side’s breakaway third goal. For the rest Martial’s introduction at Old Trafford has heralded a joyous few days. Four games in which the level of expectation has risen from abstract hope to stratospheric confidence. Warnings of ‘early days’ be gone: everything Martial has demonstrated to date screams ‘world star in the making’. Heaven indeed. Here is a player with all the requisite tools. The youngster’s first touch is outstanding, the pace blistering and his composure puts more seasoned players to shame. There’s something else though; a touch of magic whenever Martial gets the ball and runs at an opponent. The last player to pass through Old Trafford with that talent: Cristiano Ronaldo. Wayne Rooney once had that too. “He’s like you see him in a game, very calm, very relaxed, his head is on his shoulders,” says Morgan Schneiderlin of his compatriot and now international team-mate. That intelligence has seemingly accelerated adaptation to a new environment, although his manager, Louis van Gaal, admits that the real test will come when wife and child join the player in Manchester later this month. For the moment Martial is camped in the Lowry Hotel – and living on the adrenaline from goals scored against Liverpool, Southampton and Ipswich Town. In those four strikes Martial has set a high bar, but each also offers confidence in the multi-faceted talent at play. Against Liverpool Martial scored the most individual of goals, weaving between two defenders and calmly scoring; the predator emerged in United’s fixture with Southampton; and in last week’s game at home to Ipswich the teenager demonstrated the raw power at his disposal. So can Martial continue in a similar vein in more testing fixtures to come during a difficult October programme? “He has the talent for it, that I have said, but when you are 19 years old you cannot expect consistency. Mostly, he shall have a lot of dips so that I expect also from him,” says Van Gaal. It is an assessment that could once be made of Wayne Rooney, of course, now United’s elder statesman whose form and declining talent is held in stark contrast to Martial’s explosive introduction. Rooney’s acquisition came at a similarly lofty price for a teenage striker who had appeared in just 77 games for Everton before a £27 million move to Old Trafford in 2004. Rooney was electric too, scoring a hat-trick on his début against Fenerbahce in the Champions League, and grabbing 17 in 33 starts during his first campaign for United. Martial and manager alike would be delighted with a similar return in the Frenchman’s first season in Manchester. Martial’s introduction also tempts nostalgia for the player Rooney once was. In the Scouser’s golden period – between 2005 and 2011 – Rooney was for a time one of the world’s great forwards. It is easy to forget the superb number nine and gifted number 10. Two players in one. Rooney ran at opponents with electric pace, bringing supporters to their feet, much as Martial does now. As a teenager Rooney had the touch and maturity of player far more experienced. Today, Rooney is neither United’s best number nine, nor the team’s most talent 10. Too slow off the mark to trouble the best central defenders as a lone striker; too crude with his first touch to compare with the best creative players in Van Gaal’s squad, let alone on the continent. If Martial has done anything, it might well be to hasten Rooney’s gradual elimination from the team. The club might just be better for it. The temptation is to declare Rooney shot. Not that the former Evertonian has become a player of limited talent, but that too many years and too many games – and perhaps too little professionalism – have blunted Rooney’s pace and loosened the technique. Still, Rooney has scored five for United this season – three against Club Brugge, another in the Capital One Cup fixture with Ipswich last Wednesday and one in off his knee on Saturday versus Sunderland. It was the Scouser’s first Premier League goal since April. “I don’t think that is an issue for him, for me or for the club, so he shall score also in the Premier League. That I am convinced of. And you shall see it,” claims Van Gaal, but he cannot be without concern. Rooney has also scored two for England this season – both penalties – while Van Gaal claims that his captain has been unfortunate during a long league drought that reached almost 1,000 minutes of football. Martial, meanwhile, is rapidly paying off his fee, while covering for Rooney’s sharp decline. That hefty fee secured his old club in Les Ulis a £150,000 windfall as part of FIFA’s ‘solidarity’ system. It completes, in a fashion, a full circle for the teenager who once received Evra’s boots as an inspirational gift. Has anyone used “Martial Matters” in a headline yet? If not: you’re welcome! As they say, “from your mouth, to God’s ear”. For years now, the on-field team has been bent/twisted to accommodate TheWayneBoy. Rooney is – and has been – a terrific player but it’s just that he’s something of a jack-of-all-trades but master of none: an attacking version of Daley Blind, perhaps. What’s really amazing – but, alas, probably untrue – is that with the purchases of Martial/Memphis and the hoped-for emergence of Januzaj/Perreira/KidWilson there is a “NewUnited” on the near horizon. This season could be very exciting. LvG may just have been able to do what Fergie could not: oust Komrade Rooney from his command. Nonetheless, Rooney is surely better than average still, so he can provide the odd goals needed on our title charge — gasp — title. charge. 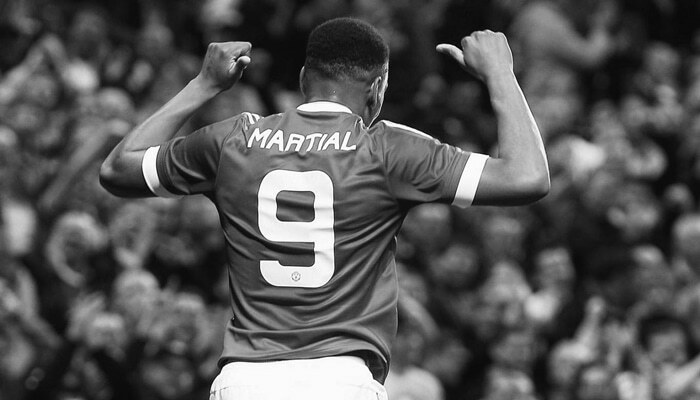 Martial-Mata-Memphis = MMM = 3M = M3 = M^3… exciting times! Tried to slip Sanogo in there eh? Very good! Top of the league at the weekend for the first time in two years, yet the main topic like it is most weeks even if it’s disguised is Rooney bashing! I would say it is a tad too early to write off Rooney. It has been ages since I saw him play well in August and September. Come October, I have every hope that his performances would improve. Another important aspect is his off-field as well as on-field influence. Apart from the midfield, we lack a strong and experienced spine. Of the regular starters, apart from Carrick, we have either young players, or players who are new to the club, or players who are new to the club and have very little experience winning trophies. Mata is perhaps an exception but while he’s a silky player and an outright superb player and a man, he doesn’t come across as a leader. We do have Bastian, but he’s in his first season with us. Toni V & Young again lack the leadership edge, not to mention neither is a regular starter. Memphis, Martial, Wilson, Periera, Janujaz (when he returns) are all brilliant footballers, but they also need mentorship and someone to take the load off their young shoulders. The success of the class of ’92 was in no small part due to the presence of Cantona amongst others. While Martial and Memphis are supremely exciting players, I do believe that despite Rooney’s past disloyalty, he does understand the club’s ethos and will be instrumental in helping us forge a new team of serial winners. As such, despite the fact that I entirely agree that he’s neither our best no. 10, nor our best no. 9 nor our best no. 8: we have to find a role for him in the team. Because his influence goes beyond what he actually does on the field (which, I am certain, will improve too). The signs yesterday, after he got a goal, were promising. One run in particular seemed to almost roll back the years! Nonetheless, I believe that to get the best out of Rooney, we need to put him as a CF (a proverbial 9 1/2 position) in a 433, flanked by the pace of Martial and Memphis, with midfield runners behind him. Rooney not contributing nearly enough this season. Rooney unhelpfully there in every starting XI regardless of merit. Rooney only ends long league goals drought with not particularly reassuring goal-line deflection off his leg. Check, check, check. All these points, all true and fair, are alluded to in your piece. Rooney’s goal against Ipswich was brilliant. In terms of control, acceleration, strength, and finishing. Point somehow not present in this piece. Balance might not fit a writer’s “narrative”, but doesn’t half help build their credibility. I can’t argue with that – there’s no question in my (alleged) mind that he’s a top talent but maybe not a top, top talent. The real question about TheWayneBoy is how he “fits” with the rest of the attacking talent – he was never a “fit” with either Dimmy or KagawaBunga but he was a “fit” with CR7 because he was willing to subordinate himself to the team-ethic, which was not a bad thing, which freed Ronaldo to be Ronaldo-being-Ronaldo. If he can “fit” with 3M (Martial,Mata/Memphis) then he will be a valuable asset until the end of his contract – what’s that ? almost three more years ?? – and maybe even beyond. That would be an attacking quartet with a wide range of skill-sets. Plus the fact that LvG has more choices in KidWilson, AdnanJ, and Pereira – not to mention some likely-lads like Marcus Rashford who seems to be tearing it up among the youth ranks, according to the reports I’ve read. So, “all of a sudden”, the problem with the attack – that only scored 65 (?) goals last year – seems to be resolved (or, at least, looks much better – also because neither Young/Valencia are first-choice but excellent back-ups). In that sense, Anthony Martial (the guy needs a proper nickname, eh ?) seems to be the so-called final-piece-pt-the-puzzle. He’s very fast, very strong on the ball, calm and composed in front of goal (i.e., NOT DannyTheLad !) and has more up-side potential since he’s not yet twenty years old. So much up-side potential that I’d imagine that Thomas Muller, Marco Reus, and Gareth Bale are quietly being removed from the radar – although I do think that, if it’s possible, a punt on CR7 would be almost irresistible for marketing reasons (and, of course, goal scoring). In all these ways, TheWayneBoy has a chance to be a key component in another great UTD team – perhaps as good as the 2008 team that was (in my opinion) even better than the 1999 treble-winners. But that’s as may be, for now it’s just a huge pleasure to see 3M consolidating their game. If, as some suggest, Anthony Martial is the new Denis Law and Denis was called ‘The Lawman’ then Anthony Martial could be simply ‘The Martial’. Of course, somewhere in there we would end up with a ‘Martial Law’ reference. “Anthony Martial could be simply ‘The Martial’ “. We’ve got to do better than that.